Find artworks, auction results, sale prices and pictures of Edward Hicks at auctions worldwide. 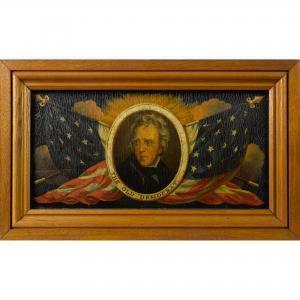 Edward Hicks - Portrait Of Andrew Jackson " The Old Democrat"
oil on canvas 24 by 30 in. Hirschl and Adler, New York, 1967; Eastern Foundation; Christie's, New York, Important American Furniture, Silver, Prints, Folk Art and Decorative Arts, January 23, 1993, sale 7640, lot 377. He began by making a league with the American Indians which were his neighbors. This is the only treaty between those persons and the Christians which has not been sworn to, and which has not been broken.-Voltaire, from Dictionnaire Philosophique, 1764American Quakers have long held William Penn (1644-1718) in high esteem, often celebrating him as our first defender of liberty, as he established the colony of Pennsylvania as a haven for religious dissenters, and largely did so through peaceful negotiations with the local indigenous populations. It is thus not surprising that Edward Hicks, whose profession and passion often seemed in conflict with his religion, would depict Penn\’\’\’\’\’\’\’\’s most famous act numerous times on canvas. The painting depicts the meeting between Penn and the Lenape Indians, which Hicks captioned PENN\’\’\’\’\’\’\’\’S TREATY with the INDIANS, made 1681 with out an Oath, and never broken. The foundation of Religious and Civil LIBERTY in the U.S. of AMERICA. Penn, to whom Charles I had granted the sizable tract of land that would become Pennsylvania and Delaware, met with the Lenape under a majestic elm tree at Shackamaxon (now the Fishtown and Kensington areas of Philadelphia) and treated for peace. Or so the story goes.Historians have long debated the date of the meeting, with opinions varying as to either late 1682 or June of 1683, as well as whether the meeting even resulted in an actual treaty. Such a treaty has been referenced in the historical record for centuries and by descendants of both parties, although the specifics of any treaty however remain murky. 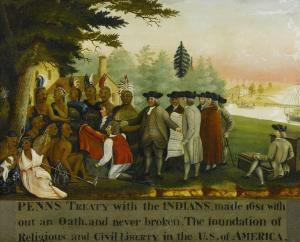 Ultimately the tradition endured through words and pictures.Benjamin West was first to immortalize Penn\’\’\’\’\’\’\’\’s treaty with the Indians with his 1771 painting, commissioned by William Penn\’\’\’\’\’\’\’\’s son, Thomas. More than a generation later, Edward Hicks, a young, Anglican-born coach maker, likely drawing upon one of the several printed versions of West\’\’\’\’\’\’\’\’s painting, would execute his own vision of the historic event.Hicks was born in Bucks County in the midst of the American Revolution, and during the first few years of his life, his family would dissolve around him: his father, a Tory, would lose everything during the war and his mother died before his second birthday. He was informally adopted by family friends David and Elizabeth Twining. Young Hicks spent a dozen years living on the Twining farm, and it was there he was exposed to the teachings of the Society of Friends.At thirteen, Hicks was apprenticed to William and Henry Tomlinson, coach makers, where he learned the trade of coach painting. In his memoirs, Hicks reflected that this period of his life was unhappy and that he was \“disgusted with [himself] and all [his] conduct.\” After several years, his misery compelled him to return to the teachings of his childhood, and upon attending a few Quaker Meetings, Hicks felt rejuvenated. In 1803, he formally joined the Society and later that year he would marry Sarah Worstall, also a Quaker. The young couple settled in Newtown where Hicks started a successful ornamental painting business.Edward Hicks\’\’\’\’\’\’\’\’s passion for his newfound faith inspired him to take up the ministry; his congregation recorded him as a minister, and he began travelling throughout the area preaching. 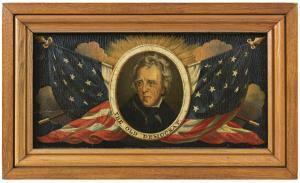 His ministerial duties, however, paid no salary, so Hicks continued in his ornamental painting to support his family. Before long, Hicks\’\’\’\’\’\’\’\’s love of painting nearly rivaled that of his preaching, and he expanded his work to include easel painting. Unfortunately, to some of his fellow Quakers, ornamental painting conflicted with the plain lifestyle proscribed by the Society. Hicks gave up this work and tried his hand at farming, but soon failed and returned to painting to support his growing family.This conflict between his artistry and his religion would persist, coming to a head in 1827 with a schism in the Society that resulted in the division of the faith into two sects: Orthodox Quakers and Hicksite Quakers. Orthodox Quakers leaned towards a more traditional, bible-based faith, while the Hicksites, named after Edward\’\’\’\’\’\’\’\’s cousin Elias Hicks (1748-1830), put more emphasis on the concept of Inner Light than on a specific set of teachings. 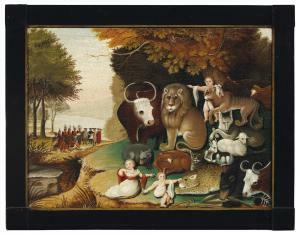 The schism caused much anxiety in Hicks, and ultimately, he largely abandoned preaching in favor of painting, although it was already apparent that he had found on canvas a new pulpit.In the 1820s, Hicks began a series of paintings based on Isaiah 11:6:The wolf will live with the lamb, the leopard will lie down with the goat, the calf and the lion and the yearling together; and a little child will lead them.Hicks would paint dozens of versions of his Peaceable Kingdom painting, each a little different, and many including identifiable background scenes, such as Virginia\’\’\’\’\’\’\’\’s Natural Bridge, but most often, a depiction of Penn\’\’\’\’\’\’\’\’s Treaty. The size of the Penn\’\’\’\’\’\’\’\’s Treaty vignette grew and finally, by the 1830s, Hicks began to produce paintings of Penn\’\’\’\’\’\’\’\’s Treaty itself, but in far fewer numbers than Peaceable Kingdom. In additional to a few privately owned versions, examples are in the collections of the National Gallery of Art, Philadelphia Museum of Art, State Museum of Pennsylvania, Mercer Museum of the Bucks County Historical Society and the Museum of Fine Arts Houston.Although modeled after West\’\’\’\’\’\’\’\’s painting of the event, Hicks\’\’\’\’\’\’\’\’ depiction differs. At the center is William Penn, surrounded by his fellow Quakers, offering trade goods to the local Lenape people. In West\’\’\’\’\’\’\’\’s version, the background is filled with activity—the building of a colony—and the seated Lenape at front holds an unlit peace pipe while at his feet is a bow and a quiver of arrows, details which perhaps speak to a determination on the settlers\’\’\’\’\’\’\’\’ part and a wary hesitation on the natives\’\’\’\’\’\’\’\’. Hicks, however, alters the scene slightly, but in a noticeably positive way: the bow and arrows are missing (in some versions, including the present version), the pipe is lit and ready for use, and the settlement in the background is smaller and less imposing. Hicks\’\’\’\’\’\’\’\’s portrayal appears a true celebration of the treaty and of the Quaker who secured its peace.Beyond celebrating William Penn and his treaty, Hicks, the sign painter, used his works (which he created in quantities) to advertise his faith—to spread the word of Quakerism. In the surviving versions of Penn\’\’\’\’\’\’\’\’s Treaty, Hicks shows off the full range of his ornamental painting skills. In most, Hicks depicts the scene on canvas and a simple title on the frame itself, however in a few, including the version at the National Gallery and the present example, the artist includes a full caption on the canvas itself, much like a tavern or trade sign. After enduring a difficult childhood and living in his words, a wayward life, Edward Hicks found not one, but two callings, and would sadly find himself divided between them. He opted for painting, the practical pursuit that would allow him to support his family, but he never gave up on his other calling. Instead, through his canvases, he discovered a friendly way to resolve the conflict between his faith and his profession. More than that, it was his paintings, such as Peaceable Kingdom and Penn\’\’\’\’\’\’\’\’s Treaty, which offered redemption to the preacher he was not meant to be. 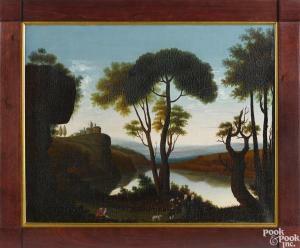 , oil oncanvas landscape with three figures, a dog, and another figurelooking on from a distance, probably the artist, 16" x 20".Exhibited: The Art Museum of Princeton University, May-July 1993,American Art from the Class of 1953 Collections. Another work byHicks from the same collection was offered at Sotheby's on January22, 2016, lot 1591. Provenance: Descended in the family of theoriginal owner until purchased by the present owner. 10 in. by 21 in. Descended in a Bucks County and Newtown, Pennsylvania family said to be related to Edward Hicks. A member of the family was named after Edward Hicks. The Quaker side of the family worshipped in the Church where Hicks preached. Doylestown, Pennsylvania, The Mercer Museum, 2000.